Struggling to entertain the kids this holiday? Can’t face another trip to the soft play? With Easter just around the corner why not take advantage of those extra days off work with a last minute family get away. Whats more, with prices often significantly lower thank in the peak summer season, it’s a great time to treat the entire family with out breaking the bank. Here’s our pick our the best short haul breaks this Easter. One of our favourite places for a short-haul family break has to be Barcelona, and the Suites Avenue Luxe are and excellent choice for that love travelling but want to feel the ease of feeling at home. Bringing together all the facilities usually offered at a hotels with the comfort of being at your own home, these luxurios apartments not one but two offers two outdoor pools, so your kids can splash about while enjoy Barcelona’s Spring weather. Just in case this is not cool enough, you will also get free tickets for the Museu Egipci in Barcelona. For the animal lover family, they also offer a STAY&DOG package. With this special offer, you can also enjoy your holidays with your beloved dog during the Easter break. The Stay & Dog package includes a luxury gift set so your four-legged friend can get the most from the trip, with their own bed and a selection of toys and treats by Trixie, the leading European pet accessory brand! The Costa Brava might have been where package tourism started but these days it’s more of a secret swathe of coast with Barcelona not far away and cute coves and artist villages like Cadaques. Set smack-bang on an unspoilt beach near the seaside town of L'Escala, Hostal Empuries has impressive eco credentials and a laid-back atmosphere. Original parquet floors and Chesterfield sofas sit alongside clean, contemporary décor, plus there’s a variety of stylish rooms to suit all sizes of family. Adults will love the on-site dining (a formal restaurant and a relaxed bistro), the glamorous spa and the tranquil library; kids will be more than happy with the weekend kids club and gently shelving beach. Just 40 minutes from Girona airport. Price: A 5-night stay from 22 April costs from £1,180, based on a family of 4 sharing a Superior Garden Quadruple Room on a room only basis. Book via i-escape.com or call 0117 946 7072. Forged from a farmhouse inherited from their grandfather, owner brothers Gian Carlo and Matteo used their architecture passion for to create 20 chic apartments each with a phenomenal lake view. Set amongst the vineyards with an excellent restaurant, families will instantly relax here. There’s a heated infinity pool, a small playground and the restaurant will deliver meals to you. A breakfast delivery is included every morning and for extra supplies or watersports, the lake and the village are a short stroll down the hill. And it’s only an accessible 45 minutes from Milan for easy transfers. Price: A 7-night stay from 22 April costs from £1,148 based on a family of 4 sharing a Standard Apartment on a B&B basis. Book via i-escape.com or call 0117 946 7072. This is glamping at its finest: with king-sized beds for the grown-ups and fun bunks for the kids, as well as fully-equipped kitchenettes, en-suite showers and a private decking area, families can well and truly switch-off, experiencing a weekend amongst nature without giving up life’s luxuries. There’s a private picnic area for sunny days, a communal BBQ cabin, tennis courts and a hot tub with views towards the Atlantic, just a mile and a half away. Spend days walking the clifftops and beaches of Barley and Shipload Bay or visit the tumbledown fishing village of Clovelly. Price: A 3-night break between 22-25 April is priced from £368 per family (£92pp) based on four sharing ‘Shipload Bay Cabin’ on an accommodation-only basis. Book via glampingly.co.uk. 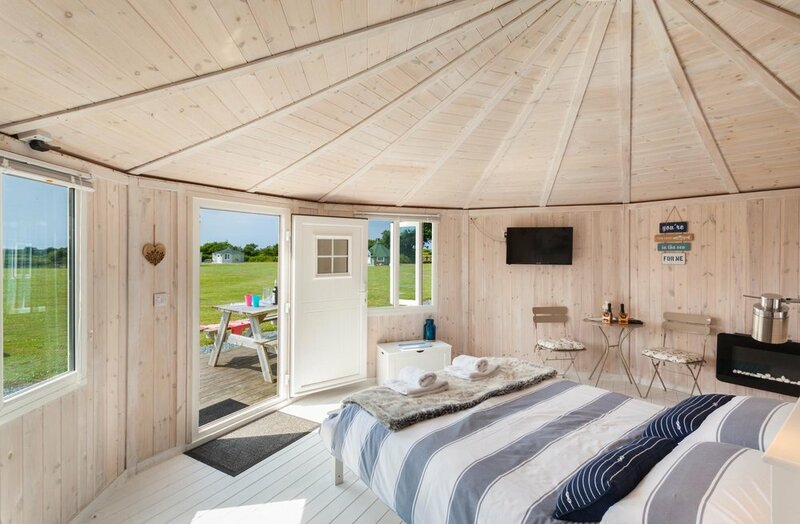 This collection of three safari lodges is located in the rural village of Brompton Ralph in Somerset. It’s perfect for large families (each sleeping up to six) and boasts well-equipped kitchens, spacious decks with chic rattan furniture, hammocks strung between trees and private wood fired hot tubs. Days are best spent playing games in the gardens, exploring Exmoor National Park (the flat Tarr Steps route is particularly good for families) or heading further north to the seaside, overlooking the Bristol Channel. Price: A 3-night break between 22-25 April is priced from £550 per family (£92pp) based on a family of six sharing on an accommodation-only basis. Book via glampingly.co.uk. If the thought of darker days and cold temperatures is spinning you into a winter slump, fear not, Health and Fitness Travel, the wellness holiday specialists has just the solution.